When you read the recipe, you’ll be dubious. There is no denying this is an odd combination of ingredients. But I promise you, this Chicken in Milk is seriously delicious. It is one of the best roast chickens I have ever had in my life. Ever. To say that this is one of the best roast chickens I have ever had in my life is a big call, I know. That’s how good this is. I then took to Google out of curiosity to see if others had tried it. To my surprise, there were many and they raved about it! Quite a few even declared this to be the best chicken they’ve ever had. I can’t say that with my hand on my heart (it’s up against Southern Fried Chicken, Korean Chicken, Karaage….to name a few! ), however, there is no doubt that this is one of the best chickens I have ever had. Possibly the best roast chicken I have ever had. And it is so much easier than traditional roast chicken. Virtually foolproof. Insanely juicy, flavour infused chicken every single time. The chicken is baked for 1.5 hours in the braising liquid so it is really tender. Not “fall apart” tender, but it’s not a roast for carving. It’s more for tearing bits off. Because it is baked uncovered for most of the time, the skin comes out lovely and crispy on top. The braising liquid, which reduces down to a sauce, is truly incredible. It infuses into the chicken and reduces down into what I call “liquid gold”. There’s a hint of cinnamon fragrance, garlic, subtle lemon freshness and the muskiness of sage, all mixed through the chicken juice. The garlic is a treat in itself. Cooked until soft, I pop them straight out the skin straight into my mouth. If there are any leftover, I spread it onto toast – best treat ever! I was convinced the milk and lemon would end up as a curdled mess, but I couldn’t have been more wrong. The milk dissolves into little bits of curd which might look a bit odd at first glance but when you take a bite, it’s almost like little tiny bits of bocconcini or buffalo mozarrella cheese. I wanted more of it! 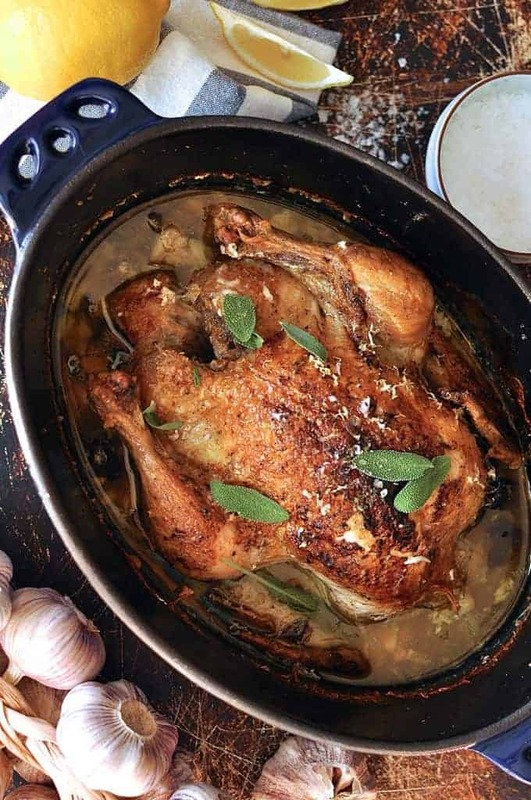 In conclusion, I’m pretty certain that this is going to be my “go to” recipe when I have whole chickens to cook. It is ridiculously easy to make, with the hardest part being the browning of the chicken (I’ve provided a few tips that I picked up when I was doing it). Though the ingredients list might seem odd, this is actually one of the best chicken dishes I have ever had. Possibly the best roast chicken I've ever had. 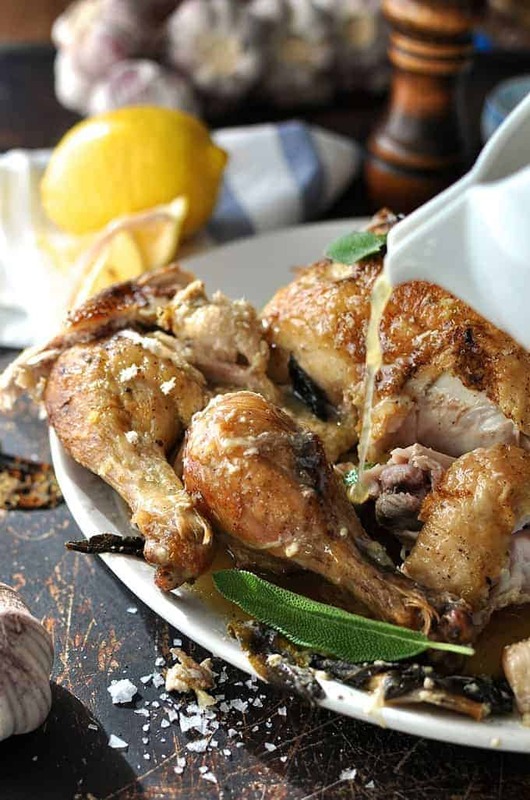 It's incredibly easy to make and produces a very tender chicken with crispy skin on top. The braising liquid reduces to a fabulous sauce that has a hint of freshness from the lemon and muskiness from the sage and cinnamon. The whole cloves of garlic cook in the skin so they are soft and mushy (mild garlic flavour, much more sweet), perfect for popping out of the skin and eating with the chicken, or spread it on toast! The milk dissolves into bits of curd which remind me of bocconcini and taste like little bursts of creaminess. Wash the chicken under water and pat dry with paper towels. Sprinkle over the salt and 5 grinds of black pepper and pat all over the chicken, concentrating on the top and sides. If you can manage it (or if you have a helper), pour the excess fat out of the pot with the chicken still in it. If you can't, remove the chicken onto a plate, then drain the fat. Add the remaining ingredients into the pot (return the chicken to the pot if you removed it). Bake covered for 40 minutes, then bake uncovered for 50 minutes (1.5 hrs in total). Let stand for 5 minutes or so before removing the chicken from the pot onto a serving plate. Serve the sauce on the side. I prefer not to strain it because I want the bits of curd and garlic on my chicken, as well as bits of sage. 1. Choose a pot that fits the chicken fairly snugly. But not too snugly, otherwise it is very difficult to brown the chicken! 2. 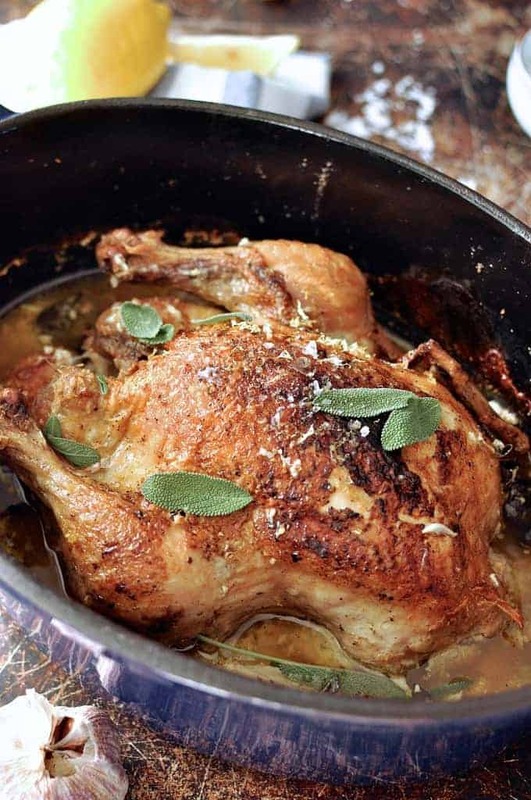 The browning of the chicken can be a bit difficult if you are using a very snug pot. But it is a key step for this recipe because browning = flavour + crispy skin and also renders the fat. The fat that isn't rendered out in this step ends up in the sauce and might be too fatty for your taste if you don't brown the chicken enough. Recipe looks tasty but you shouldn’t be rinsing raw chicken. It does nothing to “clean” the chicken. All you’re doing is spreading potentially harmful bacteria all over your sink. I ruined it. I thought this sounds so good I wondered if putting it in the slow cooker would enhance it. The recipe I emalgamted said to cook it for one hour on high and seven hours on low. Well even though I had a big 41/2 pound bird. it was chicken soup in the end. I will try again though. This is the easiest, best tasting and most tender chicken recipe I have ever made. Loved it! What a simple but tasty and interesting recipe. I had no problem browning the chicken. I did clean the pot after the browning step, as it was pretty grimey. The leftover chicken was GREAT! I’m so glad you loved it May! We loved this the first time, even though I muffed up the browning part! I’m trying it again with a tiny, almost game hen sized chicken that was given to me. It fits in a saucepan! I’ve reduced the milk and seasonings and am cutting the total oven time to an hour. I hope it’s as good as the bigger one. None the less the flavours were yummy! I made your crispy smashed potatoes too and we thought they went well with the chicken. PS: between the four of us (2 adults, 2 children) we ate the whole 1.5kg chicken! It sounds wonderful – but – is there a dairy-free version? Would soy milk or coconut milk work? I’m so anxious to try it but can’t have cow’s milk. I have seen a recipe for this chicken using coconut milk, so it must work, I’d imagine. It might have been a slow cooker recipe, but I can’t recall for sure. Otherwise, I think, the ingredients were the same or similar, also. Milk chicken is one of my favorites, and I’m sure I’d like it with coconut milk, too. I sometimes make it using just split chicken breasts, or a mixed pack of legs & thighs, if the urge for it strikes and those are all that I have in the fridge. 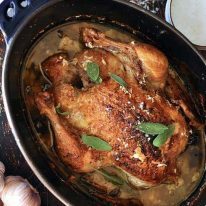 I go full-bore decadent, browning it in butter and using whole milk, but it’s the garlic, lemon, and sage flavors that make it so good! There is never anything left behind, except bones–it’s That good! Ah, excellent! Thank you, I will definitely try it. Delicious! Moist & tender. And once I got past the curdled look of the gravy/yummy juices it was all good! Would it be possible to substitute lemon zest for lemon juice- since we only have the bottled lemon juice? Could this be done in a slow cooker instead of the oven? 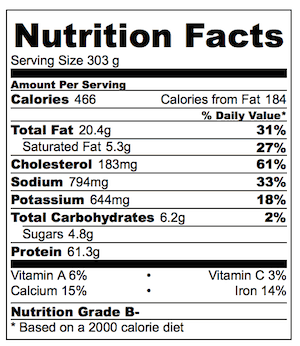 I am curious…could I adjust this recipe for a 10 lb chicken? I always use a 5-6 lb. chicken and it cooks in the same amount of time so I would adjust accordingly. OMG!! I love this chicken recipe. Could we cook the Christmas turkey this way? What would the proportions be? Thanks, Nagi. Absolutely love your recipes. Gosh YES!!! But will it fit??? ?